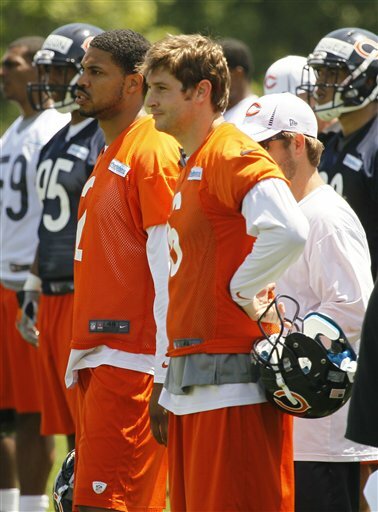 Bears quarterback Jay Cutler and backup QB Jason Campbell watch OTA at Halas Hall. Campbell works out at Bears OTA last week. The biggest, most headline-grabbing news of the Bears’ offseason was the team’s trade for Miami’s wide receiver, Brandon Marshall. But Marshall shared his introductory press conference with former Oakland Raider free-agent quarterback, Jason Campbell, who was also acquired by the Bears. Marshall may have gotten the bulk of the questions that day, but Campbell’s signing answered a big question for the Bears offense. Last year when Bears starting quarterback Jay Cutler injured his thumb in a game against San Diego, the Bears’ record was 7-3; they were on the verge of becoming a playoff team. But the Bears lost 5 of those last 6 games and didn’t make the playoffs, mainly because of back-up quarterback Caleb Hanie’s ineptitude (and to a lesser extent that of third-string QB Josh McCown). The lack of quality players behind Cutler may have been one big factor that cost former Bears General Manager Jerry Angelo his job. The need to upgrade that spot on the roster was a priority for new GM Phil Emery. When Emery signed Campbell, it gave the Bears a former starter with eight years’ experience. As a free agent, Campbell looked at his options and said, “I felt Chicago was a team that could win and compete.” He was available because he suffered a broken collarbone last season (and because the Raiders acquired Cincinnati quarterback Carson Palmer). “I don’t think about it, or worry about it,” Campbell added. 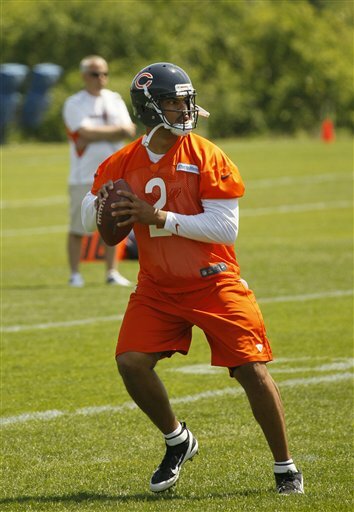 He’s working primarily with the Bears second unit, something he is unaccustomed to since he has mostly been a starter. Campbell was the Washington Redskins’ 2005 first round pick and started there for four years. He was then traded to Oakland and played there the last two years until his injury. Campbell knows his role as a back-up means he’ll have to do extra work. “The back-up quarterback is as important as a starter,” Campbell said, adding, “You don’t get the reps, so I will have extra work outs and stay after practice.” He has worked with several offensive coordinators during his career, so Campbell says he feels learning a new system is not an issue. His record might play that out: In his NFL career he has completed over 60 percent of his passes with 74 touchdowns and 50 interceptions. Speaking of family: Jason’s grandmother and a few of his aunts live in the Chicago area. He hasn’t had a lot of time to taste their “home cooking” he says, but that’s ok. “I have to watch my figure,” he adds with a huge smile. At 6’5” and 230 pounds, Campbell is quite an impressive figure behind center. Needless to say, the Bears would love to have Jay Cutler start and finish all 16 regular season games and the post season. At least now there’s a viable plan just in case Cutler has any health problems.